I usually make quinoa cereal in water with apples and cinnamon, but I wanted something more filling since I’m on this detox program. I modified the recipe to make it more simple, heavier, vegan, and no added sugar. I used blueberries because I went picking last weekend, and there’s nothing yummier than fresh picked fruit! You can substitute whichever fruit you want though. 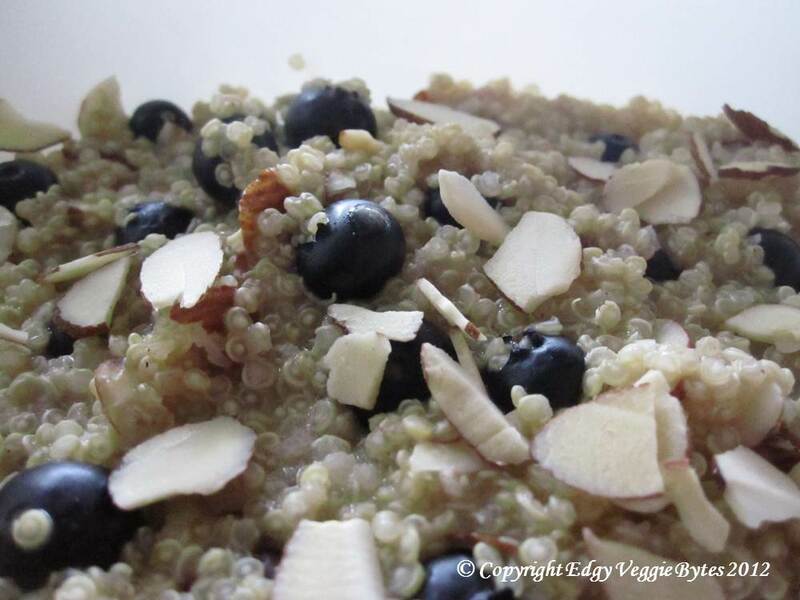 I love the combination below because the quinoa is crunchy, the almonds are nutty, and the blueberries explode in your mouth! This recipe will stay a few days in the fridge. 1. Bring the quinoa, milk, vanilla, and cinnamon to a boil. Turn the heat down to a simmer, cover, and cook for ~12 mins (or the amount of time specified on the quinoa you buy). 2. Remove from heat. Mix-in the almonds and blueberries. Serve hot or cold. What is quinona… Can I use another ingredient? Aww thanks!!! That means a lot =) Quinoa is a grain-like seed that is really high in nutrients, protein, fiber, and amino acids, which are especially good for vegetarians since we don’t have a lot of sources of these. It’s also gluten-free, which is one reason why I used it in this recipe. I haven’t tried any of millet or amaranth (kiwicha), but they may work as substitutes. Essentially you are looking for a slightly crunchy whole grain.